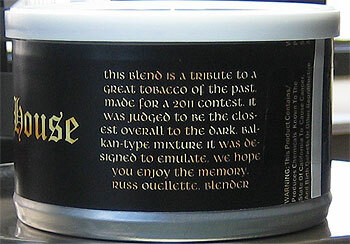 Tin notes: This blend is a tribute to a great tobacco of the past, made for a 2011 contest. It was judged to be the closest overall to the dark, Balkan type mixture it was designed to emulate. We hope you enjoy the memory. Russ Ouellette, Blender. If you say the words "Balkan Sobranie 759" in a room full of pipe-smokers, a hush will descend. The old-timers in the room will relate tales of this hallowed blends that are oft beyond belief. Wondrous tales indeed; relating how it was the cure for everything from the common-cold to reviving the comatose. Tales of how it could turn an ignoramus into a genius of the highest level. Indeed; this blend is almost as fabled as the vaunted "Arcadia Mixture" of "Our Lady Nicotine" fame. And I’ve never smoked it. I can’t tell you if Hearth and Home’s Marquee Series Black House resembles this reputedly most amazing of lost blends, you’ll just have to take the 2011 Balkan Sobranie Throwdown judges word on that. All I can tell you about is Black House. And to be completely honest with you, it wasn’t until I sat down to write this review that I knew that the Black House name was even a reference to the actual House of Sobranie. But no matter; I’m not here to review the famed 759, I’m here to review Black House. Now; before I go any further, I should tell you that setting in which I first encountered Black House under may have coloured my opinion somewhat. Indulge me for a moment, if you will, and imagine awaking beside a peaceful lake, set deep amongst a beech grove in the ranch country of central British Columbia. Stoking the campfire, the idyllic silence of the morning broken by but a handful of sounds: water lapping gently at the shoreline, leaves rustling gently in the breeze, coffee percolating happily on the fire, the cry of an eagle which has taken up residence but one-hundred yards from your location and the shrill song of loons fishing along the lake. Suddenly, a new sound pierces the morning calm; the familiar "POP-HISS" of a tin of tobacco being opened. Of course, I am not going to base this review on but a single bowl, and what follows is based on notes made over the course of a tin; however, every time I enjoy a bowl of this blend, I am immediately back at the lake, enjoying a weekend of relaxation…so I really can’t claim to be completely objective! While this blend smokes well directly out of the tin, when allowed to dry thoroughly (an hour plus), it will really shine. The tin aroma is rich and smoky, with hints of dried tropical fruits such as papaya and mango far in the background. As mentioned earlier, this blend loads well with the "three stage method". Pre-light draw brings a mild-peat flavour with hints of camphor supported on an underlying herbal note. Charring light brings a plethora of rich earthy notes and spicy flavours with nuances of paprika and cayenne providing the dominant flavours, underpinned with a subtle smokiness; certainly, the Latakia leaf is detectible, but this smokiness is the lighter, herbal like note of the savoury side of the Oriental leaf spectrum as opposed to the brashness of the dark-leaf. The first third of the bowl is predominantly spicy, with the notes of cayenne and paprika dominating, as in the charring light. 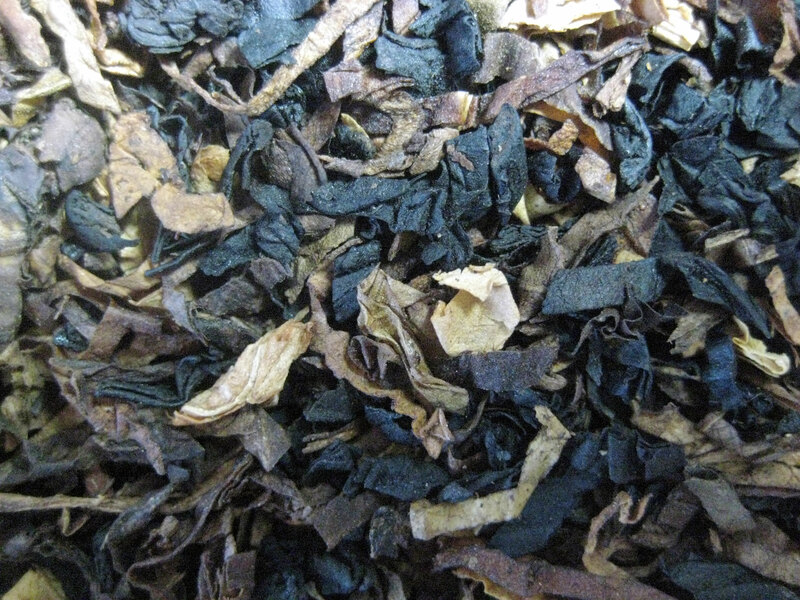 The smokiness rounds out some, with the characteristic Latakia flavour becoming somewhat more prominent, while the darker herbal flavours of the Oriental leaf slips in and out of the mix. The earthiness develops into a full, meaty flavour which supports the dominant peppery flavours beautifully (and makes me crave a dry red) with the slightest hint of anise popping up at times. As the bowl progresses through the midway point, the sharp, peppery flavours diminish somewhat (although never fully disappearing), allowing an almost honey like sweetness to begin to blossom. The Latakia and other Oriental leaf continues their wondrous dance; with neither dominating, nor hiding, well the fuller bodied leaf begins to really push the epicurean flavour of steak. At times, hints of dry-saw dust waft into the mix in a very pleasant manner. The last third of the bowl is where this blend really shines for me. Instead of developing any hint of sourness or acridity; this blend suddenly undergoes an amazing change. The peppery bite (NOT tongue bite) all but disappears, leaving one with an extremely complex, subtle and sophisticated flavour profile. The honey-sweet and earthy flavours of steak and saw-dust move to the forefront, supported by the rich, deep mélange of herbed smoke woven by the Oriental and Latakia. The smoke grows quite thick and rich, and at times, even tastes similar to a well aged Maduro cigar. I must say I was slightly surprised when I first tried this blend, I expected the dark Latakia leaf to play a much larger role in the flavour profile based on the tin-note and visual evaluation of the blend, however, the camphor and peat flavour never dominates, but rather highlights the more subtle and complex flavours of this blend, all the while weaving a delicate balance with the Oriental leaf. The only downside of this blend is an issue with my personal body chemistry; like many blends that contain Cavendish, I am guaranteed a whole whack of heartburn shortly after smoking and unless I am extremely careful to smoke slowly (which is not easy to do with this blend - one wants to create huge clouds of smoke and engulf themselves in the savory flavours and aromas) I will get bitten. 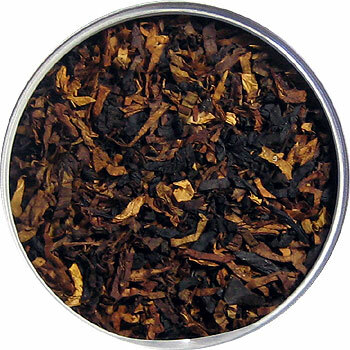 As such, I cannot really speak for the "bitiness" of this blend, other than to assure, that like any tobacco, if pushed hard enough, it will bite. This blend takes the flame extremely well; even with minimal attention, relights are not frequent. This quality seems to be retained throughout the bowl, with the heel burning just as evenly as the kindling on-top. The room-note (and by extension, the latent smoke smell on clothes) leaves something to be desired (at least to non-Lat smokers olfactory senses). I would rate this but 2/10 on the wife scale. Which is fine with me, I’m smoking for my pleasure, not hers! It should also be noted that like every other Latakia blend (and most non-Latakia blends, for that matter), the latent aftertaste of cedar-smoke and camphor, while pleasant on your palate, is not so great for others (the wife asked me to include this, it seems this explains why I haven’t gotten more than a peck on the cheek this week…). This blend is something of a sleeper when it comes to nicotine content. While this blend seems mild in the N factor through the first half-bowl, as you pass the mid-way point, the nicotine induced calm will descend. While not as strong as a dark fired flake or rope, this blend does deserve some respect. To summarize, when people ask "why a pipe", I often offer up the following analogy: Cigarettes are like McDonald’s, while not all that great (either tasting or nutrition-wise), but they satisfy a craving; while cigars are like a baron of beef, heavy, with rich, deep flavours. Pipes, on the other hand, are like having access to an entire culinary team; any dish, course, ethnicity, and of course, any liquor; you name it, pipe tobacco offers it. Following the same lines, to me, Black House is the seared tenderloin in green-peppercorn sauce. Spicy, full-bodied, slightly smoky with just a hint of earthy sweetness, and all around satisfying. While this blend is superb today, with a few months aging to allow the flavours to blend, it will be simply sublime. Definitely a welcome addition to any cellar (especially mine! ), particularly when one is in the mood for something bold and spicy. A great review, Adam! I really appreciate the work, attention to detail, and organization that is in evidence here. Writing-up a tobacco review is a daunting task, but you pull it off masterfully. Can’t wait next week to grab some at the CORPS Show…Russ please say you’ll be there?????!!!!. Great review, Adam. This is TOTALLY on my next TAD list. I HAVE smoked the original and let me tell you as I recently told a good friend, Black House DOES take me back to ‘Days Gone By’. It is absolutely uncanny the resemblance. I’d bet it was a hands down decision at the show. I smoked 759 in my late teens and loved it. I was and still am a sucker for the aroma of latakia especially in the shop that I frequented at the time. The owner, Mr. Rosen, seemed to have a pipe of it going all the time! As the review here points out that the residual effects of balkan blends does occur with Black House. This enables me to be left alone when smoking Black House. What piper could ask for more except for another Fellow of the Briar be present. In my opinion this is a very accurate review of Black House Gregg and I too highly recommend it to anyone who may fancy balkans even a little bit and anyone who wants to see what the fuss is about. Hats off to Gregg for a fine review and to Russ Ouellette for an exquisite effort. Thanks. Now I have TAD… I thought I was in remission. I loved the picture painted by describing the weekend camping in the wilderness of BC, and the “Why a pipe” part at the end. The whole review is great. Black House won the professional judging for the Balkan Sobranie Throwdown, and even though a different tobacco scored ahead of it in the “People’s Choice” (voting from the audience) - Black House is actually the one I liked best out of all three and the one I voted for. I’m almost finished with my 7th tin and it just gets better and better. A rich and complex blend for sure. There are two key points in the review that Adam nails. There is an “N” kick to this blend that makes it a little stronger than some English blends. I think this would be due to the addition of some dark fired. Secondly, although it smells smokey in the tin, the Latakia doesn’t steal the show. Very good review on the best English blend to come out of Pipes and Cigars. Charles, I will definitely be there. I’ll be the one with tobacco everywhere except in my hair, since there isn’t enough of that for the tobacco to stick to. I’m looking forward to seeing the regular attendees and the newbies. Just what I need is another of Russ’s blends to keep on hand. One of my few indulgences has been to save up until I can afford to buy enough of the original 759 so as to always have some around. I need not tell you that the prices for the old Balkan Sobranie are pretty absurd, but it’s just that good to be worth it. And now I read this. When I first heard about the Throwdown in Chicago, and the blenders involved, I wrote on another blog that I’d be surprised if Russ’s blend wasn’t the winner. I didn’t even know that it was available, so this is grand news. I will be buying many tins of this to cellar. Great review and great news! Great review. I’m going to have to try this! A really terrific review of this blend–it has become one of my favorites as well. Amazing how our sense of smell is the most effective in transporting us back to another time. When I fired up my first bowl, I was immediately transported back to my university days where you could just go down to the corner drugstore and have your choice of Balkan Sobranie Original, 759, State Express, Sullivan Powell, to name a few…. Thanks for the review. I still have some of the original BS 759 in my collection. but I also need to try this one. Excellent review. Another blend I look forward to trying! 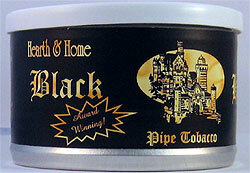 What is the best pipe tobacco you guys have ever smoked? No doubt about it, this is DEFINITELY on my next Pipes and Cigars order! I am an unabashed fan of Russ’s blends and can’t wait to try this one. Adam, that was one terrific review!